I‘m sooo excited about Christmas this year! Having a 3.5 year-old in the house definitely helps. Then there’s the fact that I get to deep fry a turkey. And I’m not pregnant so there’s Champagne in my future. Actually there’s already a bottle of Pol Roger in my fridge. Yay! To celebrate my last blog post of the year I bring you cake. Not just any old cake. A super moist chocolate cake (which also happens to have vegetables and won’t spike your blood sugar – but no need to mention these things, especially if you have a 3.5 year-old in the house). I’m looking for recipe testers for my new baking book that I’m working on. 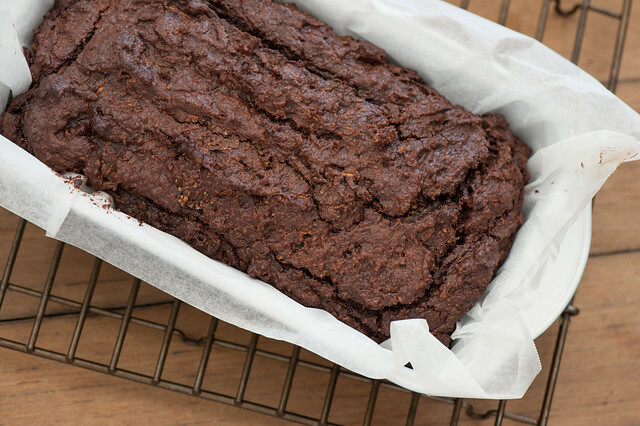 If you’re interested in sugar-free / low carb / gluten-free treats and you wouldn’t mind doing some baking over the next few months, I’d love your help! Either leave a comment below or email me (jules@thestonesoup.com) to volunteer your best baking services. There will be a little surprise thank you bonus to everyone who helps out. One of the first food blogs I ever discovered was Chocolate & Zucchini by my lovely Parisian mate Clotilde. I’m still a huge fan and I just love the idea of combining two seemingly opposite ingredients to make a cake that ticks all the right boxes. I’ve used pure stevia powder to sweeten but see the variations below if you’d prefer to use something else. 1. Preheat your oven to 180C (350F) fan assisted. Line a loaf pan 24cm x 12cm (approx 9.5in x 5in) with baking paper. 2. Melt butter in a small saucepan. Remove from heat and add chopped chocolate. Stand to allow the chocolate to melt. 3. Meanwhile, grate zucchini using your food processor or a box grater. 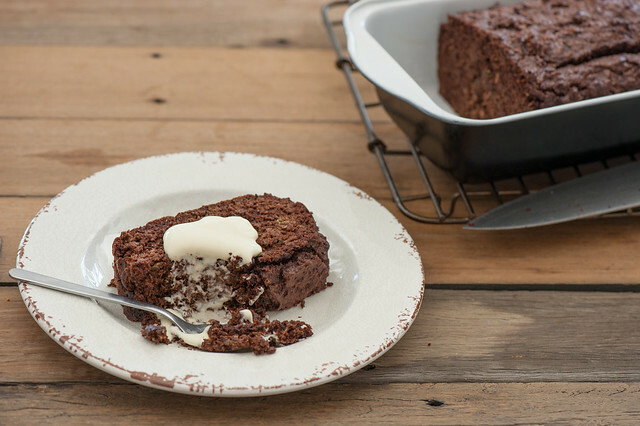 When the chocolate has melted add to the grated zucchini then add the eggs, almond meal, stevia and baking powder. Mix with a spoon until just combined. 4. Pour into your prepared pan and bake for 45-50 minutes or until the loaf feels springy when you touch it. And a skewer inserted into the middle come out without any gooey cake stuck to it. 5. Cool in the pan then slice and serve (preferably with lashings of double cream). 1. Pure stevia powder (not an affiliate link) which looks like icing (powdered / confectioners) sugar. It’s expensive but a tiny amount goes a long long way. We’re talking 1/4 teaspoon to sweeten a whole cake. 2. Granular stevia like Natvia or Truvia which looks like regular white sugar. It’s a blend of erythritol and stevia. I’ve used the pure powder in this recipe but if you wanted to use granular stevia you would need 4-6 tablespoons (add to taste). sugar lovers – replace stevia with 75g (3oz) caster sugar (superfine). If you have a super sweet tooth you might need more – taste and add as needed. no stevia – use you favourite sweetener… Honey, maple syrup or white sugar! Just add and taste until you’re happy with the sweetness level. If I didn’t have diabetes I’d totally be making it with brown sugar. nut-free – you could try replacing the almond meal with regular flour, I haven’t tried this but start with 125g (4.5oz) plain (all purpose) flour. no fan assist on your oven? – increase the set temp to 200C (400F). Check after 35 minutes just to be sure. Thank YOU so much for reading Stonesoup this year! I really appreciate it. I hope you and your loved ones have a really lovely Christmas. Looking forward to sharing lots of deliciousness in the new year. ps. See also: 16 Tasty Ideas for Zucchini. I would love to be a tester. It’s so hard to find or create healthy baked goods which are low sodium and low carb (which my husband needs for medical reasons). The recipe above is perfect. Count me in, too. I would love to do some low-carb baking! I would love to volunteer! I love to bake, I am retired and have access to all sorts of food stores, but I do live in NY. Hope that is not a problem! My husband and I are avid recreational triathletes who love to eat, so the option to bake healthier is always a good thing! I’d like to volunteer to test recipes for your new book — it’s right up my alley with how we eat. We really appreciate your recipes! Happy New Year. I would like to be a recipe tester! I would love to be one of your baking testers. For a variety of reasons I have to be low carb for life and I’m just now really figuring things out a little bit and would love an excuse to keep learning more. I would love to be a tester! We have just found out that my husband is coeliac and need some baked goodies to cheer us up! I see you already have lots of testers so I will just say since I found your website and recipes I don’t cook any other way. Whatever ingredient that I want to use, ie.cabbage, I just do a search on your website and always find a way to use it for dinner. Can’t imagine why I would ever use more than 5 ingredients again. Cooking is something I now enjoy. I am really grateful for your substitutions as well. Thank you for all the work you do for us. I would love to be a tester – specially with gluten free recipes!! I really, really want to help you taste-test your recipes! I would be so pleased to test your recipes. Thank you for this opportunity! Merry Christmas to you and your family. You must be so excited for Christmas with 2 children in your house. My mom would have to be the taster though because I can’t eat sweets being a super taster but I see you have a ton of tasters already. I think we’ve had this cake before but my cousin, who is now in FL with his dad, is a diabetic. He might actually like this cake. I’ll have to make it for him. Would love to be a tester! Thanks! I’d love to do some more gluten free baking, so if you still need testers count me in! My husband is gluten intolerant and it has been a steep learning curve for us, but ultimately I think our whole family eats better now. Ive been gluten free for 12 years now and trying to cut down my sugar intake. Would love to recipe test for you! I would love to be a tester ! Love your website and books. I am really interested in low carb and especially sugar free baking, and have been using Xylitol as a substitute for sugar here in the Netherlands, as I find stevia leaves an unpleasant after taste. Do you have any thoughts on Xylitol it’s supposed to have a low GL value? Have a smashing Christmas ! If you still want testers, please count me in. I’ve followed your blog and used your recipes for ages but recently discovered I have to eat dairy and gluten free. So going 100% GF & DF is the New Year’s resolution. Since becoming diabetic late last year I am struggling a bit with my diet, so would be interested in test baking some recipes for you, especially if they were suitable for type 2 diabetics. Thank you for your great recipes. Merry Christmas to you and yours! This is just like a cake my mum used to make when I was a child! What a delicious recipe. Hope you and your family have a truly magical christmas and thank you for all your gorgeous recipes this year. I would love to be a tester. I have a future daughter in law that is extremely glutton allergic and my husband and I are training for our first marathon so I am looking for better ways to eat. We both work so it will be interesting to see how easy they are for busy everyday families. Would love to help with some testing!! Awaiting results on being insulin resistant so need to start being good (and smart!) with my foods. I would love to volunteer… but I will have limited time. Would I be useful as a volunteer if I can only bake once every two weeks (on the weekend, basically)? I will definitely be trying this cake! I have to say, I’m intrigued! I would love to test for you. I love baking and try to reduce sugar. There are lots of willing consumers of my results at work ( read taste testers ) Seems you have a lot of offers but if you need more count me in. You omitted to mention another “kind” of stevia: namely, the dried leaves of the actual herb, which are stupid-easy to grow and which last for months if not longer in a little bottle on your spice rack! I burned out my sweet-loving brain circuits a few years ago, but when sweetness is called for, stevia is the answer (not sugar). I grew stevia a few years ago – I need to give it another try. I’m curious about how you burned out your sweet-loving brain circuits? Great combination of healthy and delicious! I will try this recipe as soon as possible! Hope you enjoy it Agness! If I have not seined up allready, then I am in. If I use liquid stevia, what amount would I need to use? Thanks Jules.Would love to be a tester .As a substitute for sugar, we use Dextrose,…sugar with the Fructose taken out. Much healthier. I’m afraid dextrose is even worse than sugar if you have diabetes like me Betty! If it’s not too late and there”s still a call for testers, I would love to do some testing. Might encourage me to do more cooking g and baking. Thanks Patsy! I’m afraid the book is pretty much finished… will totally let you know when I’m up to volume 2!